Our favorite radical feminist watchdogs are here to help museums and galleries get up to speed with #MeToo politics. 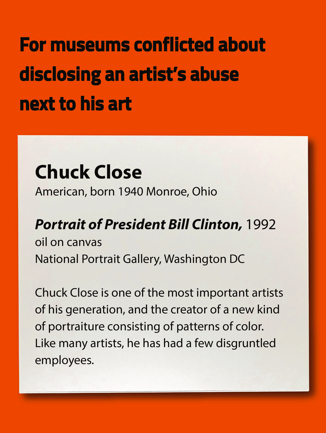 The latest work by the anonymous collective—with over three decades of fighting for equality in the at world under their belt—is a proposal for how to label art in museums by men accused of sexual violence. In their signature informational, street-art style, they offer a few different options for wall labels, based on museums' real priorities. 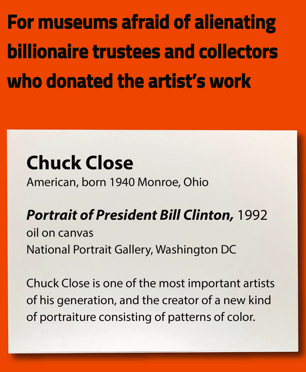 The labels were inspired by a 2006 portrait of Bill Clinton by Chuck Close. Close, the painter famous for his huge-scale portraits, was accused last year of sexually assaulting his models. He's since apologized, but has had several exhibitions of his work cancelled. Close is just one of the recent prominent members of the art world who have recently been accused of sexual misconduct, including collector Francois Odermatt, gallerist Anthony d'Offay, dealer Aaron Bondaroff and publisher of Artforum Knight Landesman. 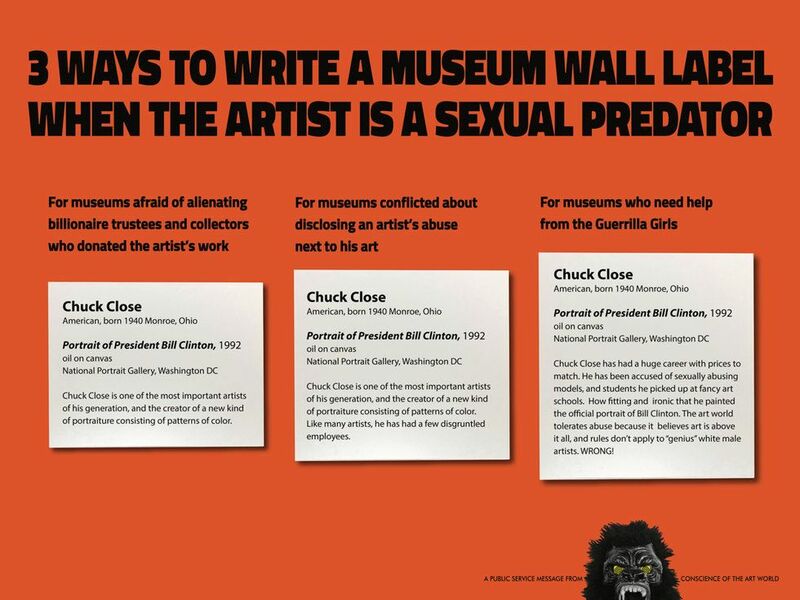 The Guerrilla Girls believe that artists guilty of sexual misconduct should be held accountable, no matter how "genius" they are, and that viewers should have context for the art they see. 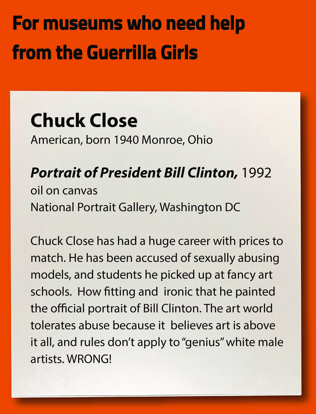 One member of the group most famous for a satirical list of "The Advantages of Being A Woman Artist," told artnet the Guerrilla Girls were inspired after seeing Close's portrait of Clinton in the National Portrait Gallery last winter: "One accused sexual predator painting another!" They saw the reimagination of the portrait's label as an opportunity to prod and push forward the conversation that museum's are currently having about #MeToo moment: "In every institution there is probably [a debate] going on right now, trying to figure it out." She says, "We thought we'd help them." The poster is currently on display at the From Nope to Hope: Art vs Arms, Oil and Injustice exhibit in London, which features over 250 pieces that artists removed from the Design Museum after learning that they hosted an event for a global arms corporation. The exhibit is being held at the Brixton Recreation Centre and runs until September 30.